No way! How have I not posted anything on here since March? Not even some terrible picture taken from tumblr in a attempt to get a few clicks? Or some half assed think piece on Australia’s darling Sonia Kruger? Maybe I was waiting to come back for something important. I guess this is it then. Yesterday was R U OK? day. I’m sure everyone was aware of it (hopefully). 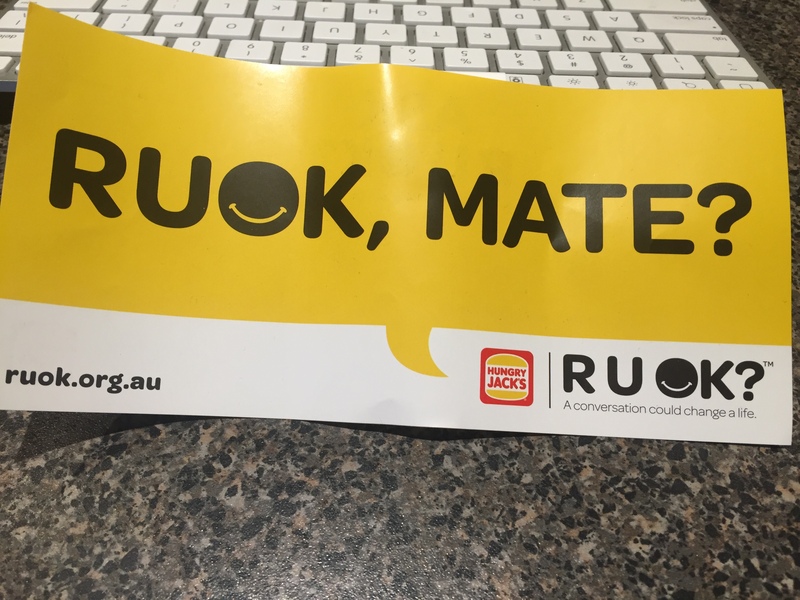 During the week there would of been a social media campaign and I’m sure traditional advertising was happening, but what caught my eye was a pamphlet around the size of a A5 piece of paper stuffed in my Hungry Jacks bag last weekend. What a great idea. I grabbed in for some serviettes but was left doing something more importantly than cleaning my salty fingers. I started thinking about myself? Was I OK? Today when I’m writing this I’m fine. I’m great actually, but what about last week? I don’t think I was doing quite as well, but we can stop talking about me in the present as I always know in the long run I’ll be fine. Everything will all work out somehow.